Front shoulder pain is often the most common complaint in the shoulder. Whilst the shoulder joint is incredibly versatile, it is also quite complex. It is also involved in a large number of movements carried out in upper body exercises in the gym. And when it comes to racquet sports there is often a lot of force generated through the joint. 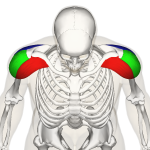 The shoulder joint is comprised of three bones, the scapula, humerus, and clavicle. Or in simpler terms, the shoulder blade, upper arm, and collarbone. The arm is kept stable in the shoulder joint by something known as the rotator cuff. As well as the rotator cuff performs this vital function, it can also, by contrast, be the source of many injuries and pain. In fact, just as front shoulder pain makes up the proportion of shoulder injuries, rotator cuff problems account for the biggest proportion of shoulder complaints.